Headstone of William Harrison Holden (1826-1913), Nancy A. Mizell Holden (1836-1902), and Florence C. Holden (1876-1903) at the Conway United Methodist Church Cemetery in 2003. William Harrison Holden arrived in Orlando from Virginia in 1865, after serving Watson's Company Florida Mounted Troops during the Civil War. The Holden family settled on the south side of Lake Holden and homesteaded 1,200 acres of land. Holden raised cattle on his land and was the first to bring the Brahman bull to the Florida strain of cattle. He also was known as one of Central Florida's largest commercial citrus growers and began the first grapefruit grove in the area. Holden served the Orange County Commission from 1874 to 1887 and sat as a member of the Convention Committee in Tallahassee in October of 1875. 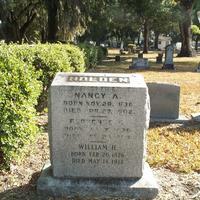 Holden's wife, Nancy, was the daughter of David Mizell, Jr., the first white settler of Winter Park. She and Holden had six children together: William Holden, Norman Holden, John Holden, Mary Holden, Cora Holden, and Florence C. Holden. Also buried here is the Holden's youngest daughter, Florence. Both Nancy and florence died of tuberculosis. "William Harrison Holden." Find A Grave. http://www.findagrave.com/cgi-bin/fg.cgi?page=gr&GRid=21440155. "Nancy A Mizell Holden." Find A Grave. http://www.findagrave.com/cgi-bin/fg.cgi?page=gr&GRid=21439931. Cook, Thomas. 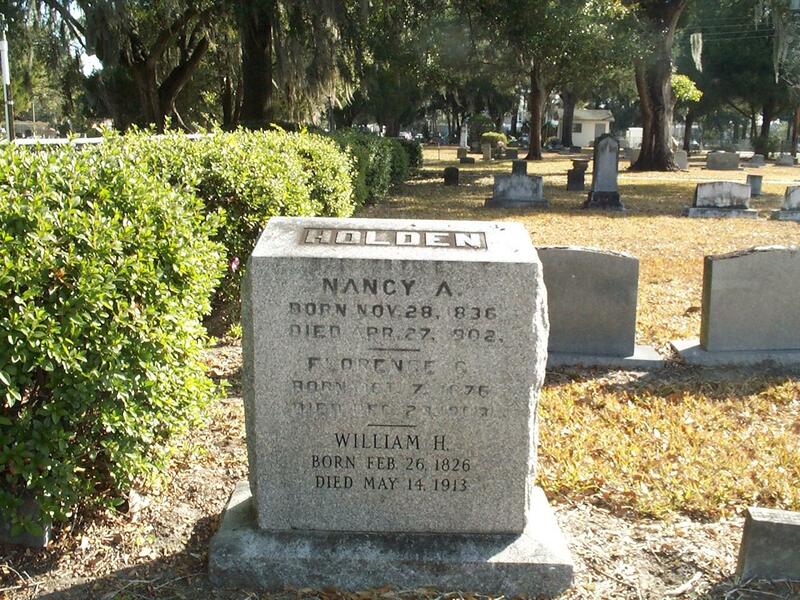 “Headstone for William Harrison Holden, Nancy A. Mizell Holden, and Florence C. Holden at Conway United Methodist Church Cemetery.” RICHES of Central Florida accessed April 18, 2019, https://richesmi.cah.ucf.edu/omeka/items/show/1917.